This lease amendment gives the tenant expansion space, as well as the right to control adjacent space through rights of first refusal. The tenant is also the beneficiary of additional renewal options with the rent based upon market conditions (fair market rentals). THIS LEASE AMENDMENT (the “Amendment”), is made and entered into this _____ day of ________, by and between COMMERCIAL PROPERTY LANDLORD, INC., hereinafter referred to as "Landlord," and ACCEPTABLE TENANT, INC., hereinafter referred to as "Tenant," and modifies that certain lease (the “Lease”) executed on ________________ by and between Landlord and Tenant. A. Pursuant to that certain Lease Agreement, dated _______________ , by and between Landlord and Tenant (the "Original Lease"), Landlord leased to Tenant, and Tenant leased from Landlord, certain premises, consisting of approximately ________________ (_______) rentable square feet of space (the Original Premises") identified in the original lease as _______________________. B. Pursuant to that certain First Amendment to Lease dated _______________ (the "First Amendment"), Landlord and Tenant amended the Lease to extend the term of the Lease through ______________ ("Prior Termination Date"). The Original Lease, as amended by the the First Amendment, shall be referred to herein as the Lease. The Original Premises and the Additional Premises shall be referred to herein collectively as the Premises. C. Landlord and Tenant desire to amend the Lease to, among other things, (i) extend the Lease Term through ___________________, and (ii) to make other changes to the terms of the Lease. D. Capitalized terms used in this Amendment shall have the meaning ascribed to such terms in the Lease unless otherwise defined in this Amendment. 1. Effective Date. This Amendment shall be effective as of _____________. 2. Additional Premises. Landlord and Tenant acknowledge that (i) the First Amendment amended the Original Lease to add the Additional Premises to the Original Premises commencing on the effective date set forth in the First Amendment and at the rental rate set forth in the First Amendment, and (ii) the Additional Premises contains ______________ (_____) square feet. As a result of the addition of the Additional Premises to the Original Premises, the aggregate square footage of the Premises was increased from __________ square feet to ___________ square feet, and the Original Premises and the Additional Premises, collectively, shall be deemed the Premises, as defined in the Lease. Exhibit A to the Lease is hereby replaced with Exhibit A attached to this Amendment. The Additional Premises is subject to all the terms and conditions of the Lease and except that Tenant shall not be entitled to receive any allowances, abatements or other financial concessions granted with respect to the Original Premises. 3. Extension of Lease Term for the Premises. The Lease Term of the Lease is hereby extended for a period of _________ months and shall expire on ___________ ("Extended Termination Date"), unless sooner terminated in accordance with the terms of the Lease. That portion of the Lease Term of the Lease commencing the day immediately following the Prior Termination Date ("Extension Date") and ending on the Extended Termination Date shall be referred to herein as the "Extended Term". ____________ Dollars ($_________) per month for the period commencing _________________ through _______________, _________________ Dollars ($___________) per month for the period commencing ____________ through _________________ , ________________ Dollars ($___________) per month for the period commencing ______________ through _______________ , and _______________ Dollars ($_____________) per month for the period commencing ______________ through _________________. B. Tenant shall have the right to lease the Adjacent Space (or portion thereof described in the Acceptable Offer Notice) upon the terms contained within the Acceptable Offer Notice if Tenant elects to do so by delivery of written notice to Landlord within two (2) business days of receipt by Tenant of the Acceptable Offer Notice. 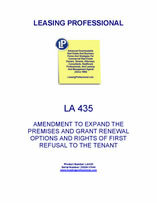 C. As soon as reasonably possible following the timely acceptance by Tenant, if any, of the Acceptable Offer Notice, Landlord and Tenant shall enter into a further amendment of this Lease to include the Adjacent Space or applicable portion thereof within the definition of Premises under the Lease and to adjust each of the affected provisions of the Lease to accommodate the economic terms and conditions set forth in such Acceptable Offer Notice. D. If Tenant fails to provide Landlord with its written notice of exercise within the two (2) business day period, then Tenant shall be deemed to have elected not to exercise its right of first refusal with respect to the particular Acceptable Offer Notice at issue and Landlord shall be free to enter into a lease on such terms with the proposed tenant. Notwithstanding the foregoing, if Landlord negotiates with the proposed tenant an effective rent less than ninety-five percent (95%) of the effective rent offered to Tenant but rejected or a lease term that differs by more than one (1) year from the lease term offered to Tenant but rejected, Landlord shall be required to submit the more favorable terms to Tenant for its review. Tenant shall have two (2) business days after receipt of the more favorable terms to accept or reject such terms. If Tenant rejects the terms, Landlord shall be free to enter into a lease on such terms with the proposed tenant. The right of first refusal set forth herein shall be personal to the originally named tenant herein and any permitted transferee of this Lease (regardless of net worth). Tenant's right of first refusal shall be continuous during the Extended Term and shall terminate at the expiration of the Extended Term. Tenant's right of first refusal shall be subject to the terms of the existing leases (including renewals) of space in the Property, including any renewal, extension, expansion, first offer, first negotiation and other similar rights, regardless of whether such rights are executed strictly in accordance with their respective terms or pursuant to lease amendments. Subject to the immediately preceding sentence, Tenant's rejection of any particular Acceptable Offer Notice shall not relieve Landlord of its obligation to again offer any Adjacent Space to Tenant at any time that the Adjacent Space subsequently becomes available.